I have been using some premium products from Anherb since many months. Not any product has created any issue, but gave me wonderful results as promised by the product. 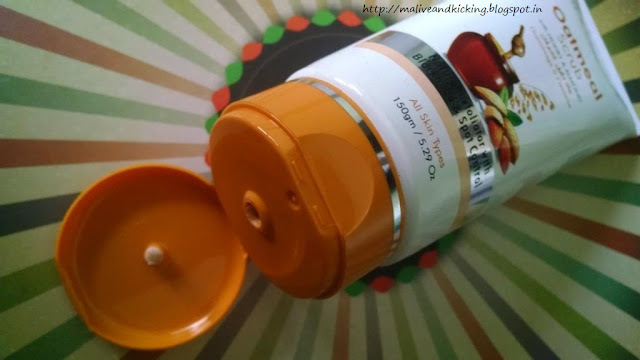 Recently the brand launched some more products and I got to lay my hands on few of them. 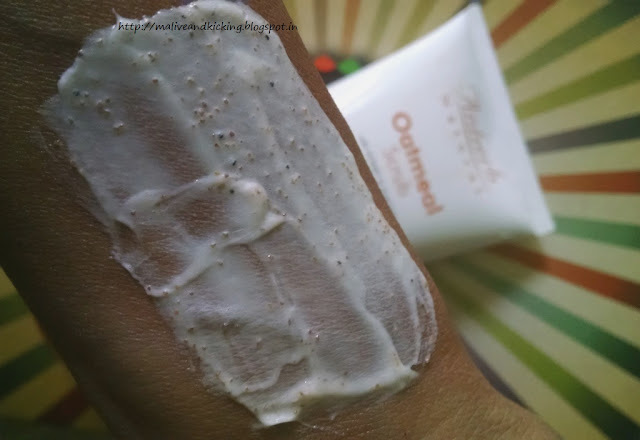 Today's review is on the Oatmeal Scrub that I am using for almost a week or so. It contains Oatmeal, Almond Shell Powder, Golden Pearl, Honey. How to use: Moisten the desired area & then apply with fingertips. Massage gently avoiding area around the eyes. Rinse well & pat dry. 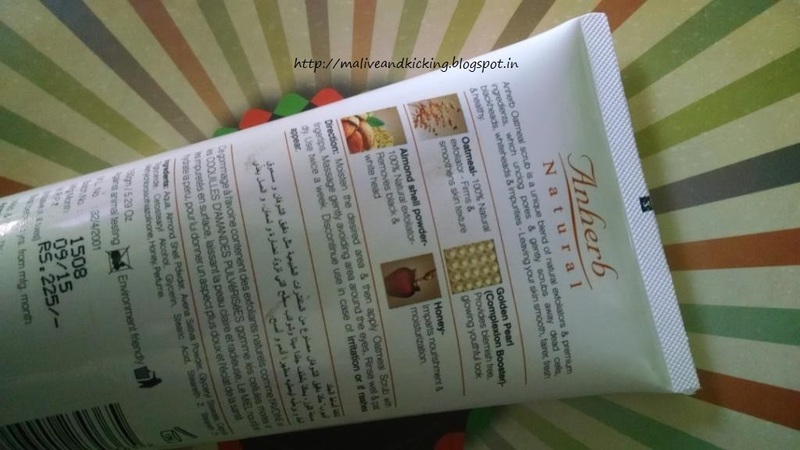 The Anherb Oatmeal Scrub comes in a milky white squeeze tube packaging with saffron color flip cap on it. The cap shuts with a click and doesn't tend to get loose. The nozzle on the cap helps to dispense sufficient quantity with total ease. The tube gives you complete description about usage, ingredients etc. The packaging is much more hygienic than jar packs. 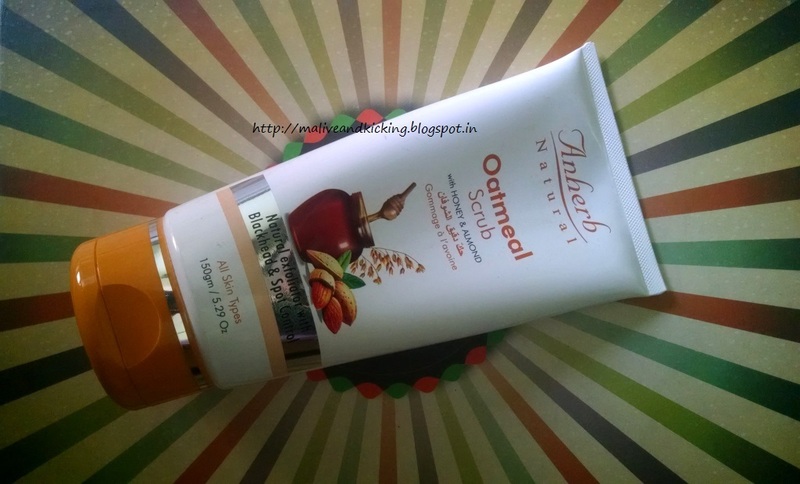 Being infused with key ingredient oatmeal, the scrub is meant to be used for dual purpose as a moisturizer and scrub. The scrub is pale brown in color. The dark brown granules are clearly visible in the paste. The granules are not very coarse and actually feel on your skin with gentle rubbing also. The scrub is not a soapy one and you will not notice any foam formation while massaging on your wet skin. I can notice the cleaner and glowing skin post usage. The scrub will also be liked more by oily and normal skin people in my opinion. Since mine is dry skin , I felt little dryness after rinsing it off. Despite any stretchy feel on my skin, I follow it up by wearing a layer of mild moisturizer to lock some skin hydration in and my skin felt softer for longer. For others, I believe the honey as a natural antibacterial and healing agent will provide a light, non greasy, soothing nourishment to the skin. The scrub smells very nice and feels even more refreshing when it adds to the squeaky clean feel on the skin. The scrub works against whiteheads very well due to Almond Shell Powder infused in the scrub. The blackheads also get reduced, but don't go completely. May be after few more days, there is better effect. I recommend its usage every alternate day for silky smooth skin. This scrub promises moisturized, problem free, youthful skin with a nourishing formulation, so it will be particularly useful during the cold winter months when skin tends to get dry and irritated. Meant for all skin types. Not foamy like a soap based formula. No harsh granules to hurt skin. Works well to reduce whiteheads n blackheads. Sounds nice. Its great that it works well on blackheads and whiteheads.